The Bonnet Macaque (Macaca radiata) is a macaque endemic to southern India. Its distribution is limited by the Indian Ocean on three sides and the Godavari and Tapti Rivers along with a related competing species of Rhesus Macaque in the north. The Bonnet Macaque feeds on fruits, nuts, seeds, flowers, invertebrates and cereals. 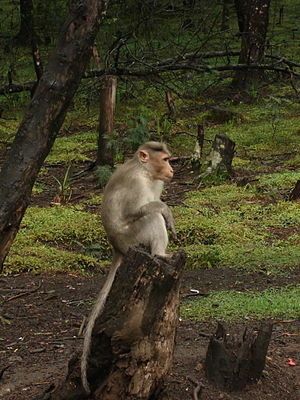 In southern India this macaque exists as commensal to humans, feeding on food given by humans and raiding crops and houses. Please note that the above slideshow is automatically created by searching Flickr and does not contain manually curated images. Hence, it is likely that some images may not be of Macaca radiata. This page was last modified on 8 February 2011, at 08:11.